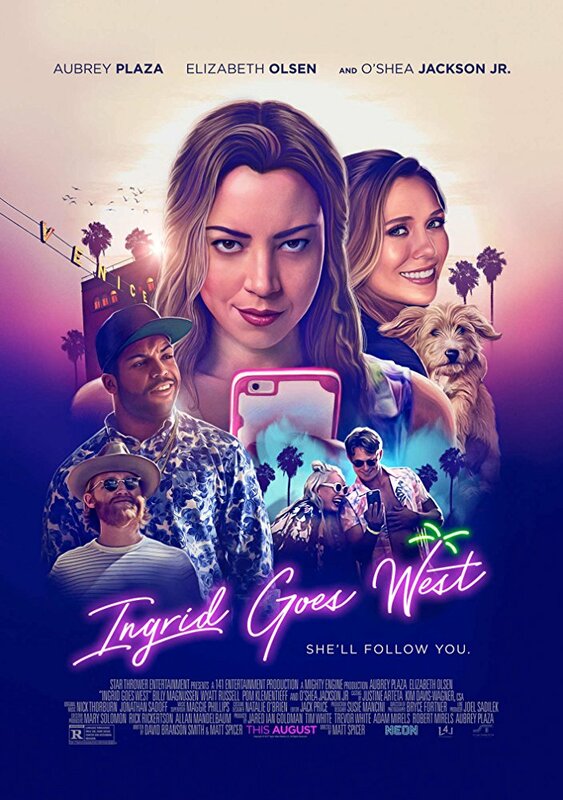 A timely and extremely uncomfortable cringe comedy take on SINGLE WHITE FEMALE for the Instagram era, INGRID GOES WEST manages to stay on course and never lose its way despite some wild shifts in tone. 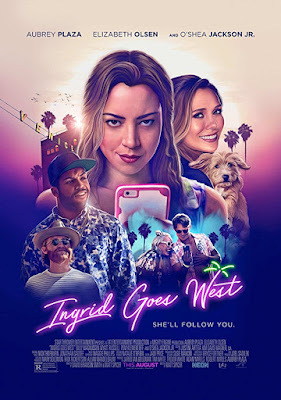 It's got some career-best work from PARKS AND RECREATION co-star and deadpan icon Aubrey Plaza as Ingrid Thorburn, a desperately lonely young woman introduced crashing a wedding in tears and pepper-spraying the bride, a supposed bestie who didn't even invite her. Ingrid is slapped with a restraining order and committed to a mental facility, and we soon learn the two were barely acquaintances after Ingrid commented on one of her posts and immediately began stalking her, attempting to ingratiate herself into her life in a purely one-sided friendship. Ingrid spends her days scrolling through Instagram and liking every pic she sees. She's also still mourning the recent death of her mother, and after happening upon a magazine article about trendy "social media influencer" Taylor Sloane (Elizabeth Olsen), she immediately follows her on Instagram. When Taylor responds to her comment, Ingrid cashes in her mother's $60,000 life insurance policy and impulsively moves to L.A. to find Taylor, tracking her through her posts and following her home, and as soon as Taylor and her artist husband Ezra (Wyatt Russell) step out, Ingrid lets herself in, kidnaps their dog and waits for the reward offer to call and set up a meeting. Ingrid and Taylor become fast friends, going on road trips and hitting the trendy L.A. spots, with Ingrid completely making herself over in Taylor's image and quickly growing discontented when Taylor can't devote all of her attention to her. A thoroughly incoherent sci-fi hodgepodge that manages to rip off BLADE RUNNER, I ROBOT, THE MATRIX, THE HUNGER GAMES, DIVERGENT, THE TERMINATOR, and TRANSFORMERS in its first 15 minutes, SINGULARITY's behind-the-scenes story is more interesting than the film itself. The story is a jumbled mess, dealing with Kronos, an AI program designed to save Earth, but immediately deciding on its own volition that humanity isn't worth saving and promptly blowing up everything and killing billions of people. 97 years later, the world is a post-apocalyptic wasteland with small clusters of humans still existing, though we only see two: Andrew (Julian Schaffner) and Cania (Jeannine Wacker), a fearless warrior with a wardrobe provided by Katniss Everdeen. They're making their way to Aurora, a supposed safe haven where humanity will attempt to rebuild itself, but Andrew is actually an advanced synthetic lifeform so real that even he's unaware that he isn't human. 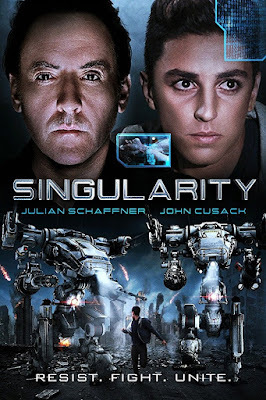 Their journey is overseen from a command center inside the Kronos program, where the uploaded avatars of misanthropic Kronos designer Elias Van Dorne (John Cusack) and his flunky (Carmen Argenziano) monitor their whereabouts to discover the secret location of Aurora. Savvy moviegoers will notice something strange almost immediately and it becomes glaringly apparent with each passing appearance of Van Dorne: Cusack doesn't seem to be in the same movie as everyone else, and that's because he's not. Ten years ago, director Xavier Gens made an immediate splash with genre fans for the bold and ballsy FRONTIER(S), his contribution to the wave of extreme French horror. Immediately after, he directed the Luc Besson-produced actioner HITMAN, though he was, of course, given the Hollywood welcome by being fired in post-production after clashing with Fox execs. It would be five years before he resurfaced with the dismal THE DIVIDE, a repugnant post-apocalyptic SALO knockoff that could easily have been titled LAST BOMB SHELTER ON THE LEFT. Gens directed a short segment of THE ABCs OF DEATH prior to another extended leave from the big screen, directing a few episodes of the Euro TV series CROSSING LINES before recently returning with the barely-released THE CRUCIFIXION. 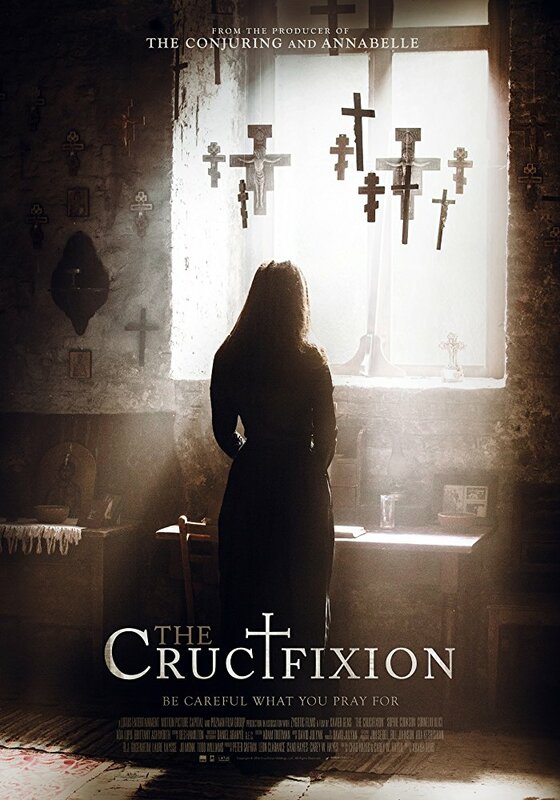 One of the dullest horror movies of the year and maybe the least-warranted demonic possession film since THE VATICAN TAPES, THE CRUCIFIXION is inspired by the "Tanacu Exorcism" in Romania in 2005, where a priest and four nuns were accused of murder when an exorcism on an allegedly possessed nun resulted in her death. Here, the case is investigated by fictional American journalist Nicole Rawlins (British actress Sophie Cookson, from the KINGSMAN films), a non-believer who journeys to Romania to interview jailed priest Father Dimitru (Catalin Babliuc) and the family and friends of the late Sister Adelina Maranescu (Ada Lupa) to prove God isn't real. She's haunted by calculated, predictable jump scares and loud noises and has weird sexual dreams about Father Anton (Corneliu Ulici), a young priest who worked with Father Dimitru.